Download MAME ROMs, games and BIOS files. Complete ROM sets, update packs and links to the best places to download games for solid retro arcade coin-op game fun. No tricks. No ads. No surveys. Follow the instructions for downloading all MAME ROMs then follow the additional links in this page to get even more games and software. This page is updated at least once per month with new game sites, news sites, emulator sites and download instruction changes. Come back often. Share this page with friends and keep it in your bookmarks. Only the best of the best emulator software and emulator sites get into this page. Please note that the emulator scene has started to move underground due to pressure applied by Nintendo’s bullyboys. Some sites have closed. Some sites have gone into hiding. Other sites have disabled downloads. This article lists active public ROM download sites. Sites that have disabled downloads are listed with their titles crossed-out. We will remove the strike-through text as soon as they re-enable downloads. The latest version of MAME is 0.208. The latest MAME version number is always shown in the official MAMEdev change log post, usually the first post in the page. The minimum requirement to use MAME to play arcade games is the MAME emulator and a set of core MAME ROMs. Download sites where you can get ROMs are shown further down this page. The MAME version and ROM set version should be as closely matched as possible. To get the best MAME experience download MAME Extras. To have the biggest list of playable games and apps you need to download the Software Lists and the CHDs. Software and BIOS packs: what are they? The core MAME ROMs are the files needed to play arcade games and to use home computers and games consoles emulated by MAME. Software List ROMs are the home computer games, console games, and applications software supplied in a way organised specifically for use with MAME e.g. Atari 800 games. CHD files, Compressed Hunks of Data, are the CD ROM and Laser Disk data clones needed for some of the arcade ROMs to be played. CHD SL (CHD Software List) files are the home computer software and console software CD/DVD ROMs needed to play some MAME home computer games and apps. MAME Extras provides game icons, emulator overlay images, information about the emulated system in play (i.e. the ‘about this emulator’ text), cheats and other interesting things that enhance the MAME experience. Any file set that has SL added to the end of its name is a Software List set and contains software for emulated home computers and games consoles. The core MAME ROMs are provided in three package types: split sets, merged sets and non-merged ROM sets. Only one type of set is needed by MAME. If you download the split set of MAME ROMs then you do not need to download the merged and non-merged sets. The number of arcade titles, console titles and other software titles shipped in split, merged and non-merged sets is the same. The sets differ in the way the files are stored. In Non-merged sets every ZIP file contains every file needed to run the game stored in the zip file. Any game can be pulled out of the set and stored by itself and it will still work. Non-merged sets stamp the biggest storage footprint of the three types. In Split sets the files are split into parent machine and software sets and clone machine and software sets. Parent sets contain the files common to their child clones. The clones contain only the files that differ from the parent set. This saves storage space but both the parent and its clones are required for the games to work. If you want to share a game with a friend you need to share the game’s parent set and its clone (or clones) that you want to share. in Merged sets the parents and clones are bundled together in the same ZIP file. Merged sets take a little less storage space than split sets but have the advantage of related files being packaged together which means they are easier to find and share with friends. Explained another way, with non-merged sets, even when games A, B and C share some of the same files required for them to run, each game is still packaged with its own copy of all the files required for it to run. If each game has 3 files in common + 1 unique file then each game still ships with 4 files as a self-contained unit (that would be 12 files total for the 4 games). With split sets, when games A, B and C share some of the same files required for them to run, each game is treated as a clone of the other. The unique files required by a clone are packaged into 1 ZIP per clone and the files common to all 3 clones are packaged in a separate ‘parent’ ZIP. If each game has 3 files in common + 1 unique file then each game clone ships with its 1 unique file, and the 3 common files are supplied in their own parent set (6 files needed instead of 12). A good explanation of the differences between Non-Merged, Split and Merged sets is here. Do not mix split sets, merged sets and non-merged sets into the same ROM packs. It is ok to use split core ROMs and merged CHDs because they are different ROM set types. It is not ok to download and mix together split core ROMs and merged core ROMs. There are were two ways to download complete ROMs for MAME 0208. Now there is only option 2. We had to remove option one to protect the download site from Nintendo’s bullyboys. We will restore option 1 as soon as we have a suitable replacement for the download site we had to remove. Download instructions and tips are provided throughout this page. A full set of core MAME ROMs provides a little over 35,000 fully working arcade games and emulated computer systems. A full set of CHDs and Software Lists provides over 100,000 more games and applications for use with the home computers and games consoles emulated by MAME. Penguinistas can open a terminal to type mame -vsoft to check which of their programs are working and usable with the installed MAME version. This also provides a full software count. MAME ROM sets are provided as separately downloadable packages that each satisfy specific emulator features or as one humongous downloadable package that contains all files needed to run all MAME software with all possible features available. Download either the complete set, which is several TBs of data (this set is not always available), or save space and download only essential basic packages separately. MAME 0.208 Multimedia & MAME 0.208 EXTRAs provide files that improve the MAME user experience. The Extras are sometimes a release or two behind MAME. It is ok to use an older release if the latest package is not yet available. This was the quickest and easiest way to download the most up-to-date MAME ROM sets. We had to remove the site we advertised here to help protect its community from Nintendo. We will update Option 1 as soon as a suitable replacement becomes available. By ‘suitable’ we mean a download site that is easy to navigate, trustable and which provides free access to all downloads. Download out-of-date ROM sets from archive.org (the links follow next) then use update packs to bring these sets up to date. Full Pack: MAME ROMs v0.197 (merged) 58.9GB. The arcade ROM sets, devices and BIOSes. 0.202 Software List ROMs (merged) (55.2GB). Software for MAME home computer systems and games consoles. 0.196 Extras (42.7GB). This includes Marquees, Sounds, History, Artwork, and other similar contributions. 0.196 Multimedia (18.6GB). Game video samples. MAME update packs are released every month, usually the last Wednesday of the month. Update packs are normally released a week after a MAME update is published. Each update pack includes the latest new and improved MAME system and arcade game ROMs. To our knowledge, RetroROMs is the only publicly accessible place to download new and old MAME update packs. The update packs are located in Downloads > MAME > Update Packs. Downloads are limited to 100 files per 24 hours. These limits can be removed by upgrading your RetroROMs account. Download and install one update pack at a time. Install each pack in ascending pack number order to prevent accidental overwrites of newer files by older files. Example instructions are given below here. Only arcade game and BIOS updates are shipped with ROM update packs. This means home console games and retro computer games stored in the Software Lists and MAME Extras need to be updated separately. Download the ROMs you need using either Option 1 or Option 2. Move the downloaded ROM packages to your MAME ROMs directory or drive. If you went with Option 1: do not unzip compressed files within the cloned directories. Extract the downloaded files. Windows users will need 7zip to unzip the packages properly. The extracted files are themselves in zipped/compressed format. Do not unzip these files. Download update packs (If needed. See Update Packs above) and unzip them into your ROMs location. Update the MAME ROM directories to add the location of the new update pack. You can use a ROM manager to combine ROM packs, or not use a ROM manager and leave the packs unmixed. Download packages from the MAME Extras section. 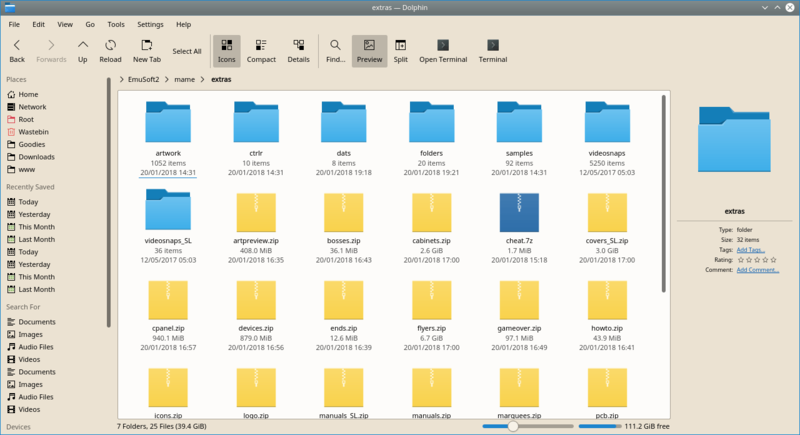 Keep the main ROMs and the Software Lists in folders of their own. Again, after the first unzip the unzipped packages will contain more zipped packages which should be left zipped. Keep the Extras, Video Snaps and CHDs in their own folders. 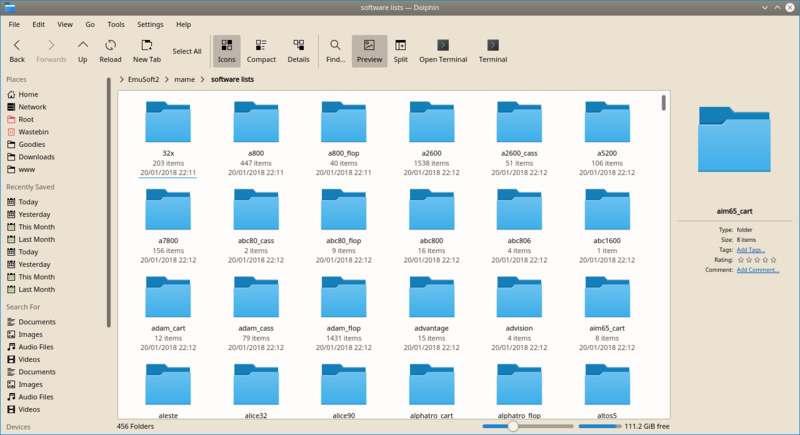 The files should be stored similarly to the structure shown in the images shown in the gallery below. Open MAME then select Configure Options. Set the location of the ROMs, CHDs and Software Lists via Configure Directories. Set the location of the Extras via Configure UI. The ROMs directory might be called the ‘rompath’ in your MAME configuration panel. You can create a ROMs directory along with other directories on any attached suitable storage device such as an internal hard drive or an external USB drive. Just remember to configure MAME to tell it where to find the directories. Linux users can find a mame.ini and ui.ini file in the directory home/.mame. If you trust yourself you can edit these files manually to quickly set the MAME directory locations. Below here is an example of how those directories might look in mame.ini. The example shows an excerpt from ~/.mame/mame.ini. Your own directory paths will be different to those shown in the example excerpt. MAME is now both MESS and MAME in a single package. Since version 0.171 the complete ROM packs for MAME include files for arcade machines (coin-ops), consoles and all the other computers previously emulated by MESS. Frontends help us organize and play game collections more quickly than by using the standard MAME user interface. QMC2 is the best MAME frontend for Desktops and laptops. QMC2 works in Linux, Windows and Mac. The official guide to QMC2 shows where the ROM paths are set and how to change them to reflect your storage archive. The tutorial that tells you how to install QMC2 and MAME into Ubuntu is here. Users of Ubuntu 17.10 and above will need to install QMC2 manually as shown here or use this installer script. Quickplay is an alternative multiplatform frontend to try. OneUp! is the Linux source code installer for MAME and QMC2. MAME is slow to load home computer software. This is especially apparent when MAME loads cassettes for old 8 bit computer systems. Speed up MAME machine and software loads by pressing Insert then Page Down. The Insert key deactivates the emulated system’s key mappings and allows us to use, for example, Tab to adjust system settings. The Page Down key overclocks the emulated system for as long as it is held down. Page Down makes the emulator run faster. MAME control keys are explained here. Atari800 games. Make sure you download all disk collections. New releases are added regularly. World of Spectrum. As complete a set of Spectrum software as possible in one place. The-tipshop. Game tips, cheats and maps for Spectrum software. New games and remakes news. 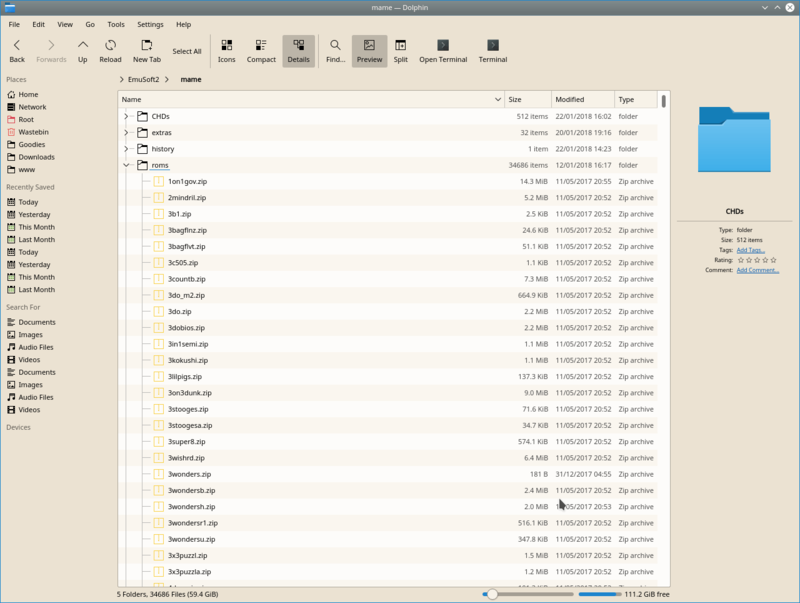 Retroroms (home) and downloads browser (registration required to download files). Penguinistas can use the Get-Em! Atari games downloader to bulk download all Atari 8-bit game disks. 2018 saw the end of LoveRoms. Nintendo killed it off with lawyers and DMCA notices. If the site resurrects we will restore the links to it. Emuparadise has disabled downloads until the site admins can decide which way to move in he current climate. We can cheat if we want to. There is nothing wrong with cheating if it gets you further in life and games (as long as no one gets hurt and no lies are told). Download cheat files for MAME. Read the instructions to see where to put the cheats file. Your MAME frontend might need the file to be placed somewhere special. The Internet Archive has a good collection of software resources. The Archive preserves the Internet’s history for future generations to enjoy and research. Future archaeologists will find it useful. The index page for The Archive’s software history is here. MAME struggles to play some classic games. For example, Elektra Glide for the Atari, one of my favourite Atari 800 games, will not run on MAME at all. If you find a game or program that MAME will not run, try one of these emulators instead. Some of these emulators offer features not found in MAME such as easy cheat code installation (think POKEs) and ways to edit program code. Atari800 will run most or all Atari games including those written for the Atari 400, 800, 130, 1200, 2600, 5200 and 7600. Game performance is better on Atari800 than on MAME. Atari800 is in Linux distro software repositories but the shipped version is usually very out-of-date. Install with the Linux installer for Atari800 found here or download and build the source code yourself. I recommend the installer script. Download Atari 8-bit games disks with Get-Em! Most Sinclair Spectrum games work on MAME without any problems but these next emulators have cheat, coding and other features that MAME lacks. Retro Virtual Machine a Spectrum and Amstrad CPC emulator for Windows, Mac and Linux. ZX32 will let you POKE and code until your 8-bit heart explodes in spectacular beams. USP Spectrum Emulator is touch screen compatible, shows a full library of games and apps that the emulator will download from vtrdos.ru, worldofspectrum.org, rzxarchive.co.uk and bbb.retroscene.org and runs almost every game I have looked to play on it. MAME and all is MAME for Android. ZEsarUX. Funny name but awesome Spectrum emulator. Emulates every version of the Spectrum computer ever made or imagined, including ZX Next, ZX Uno and Jupiter Ace. Also emulates Amstrad CPC 464 and SAM. Option to build a custom emulator. Want better graphics and sound? Option for this too. See it in action here. 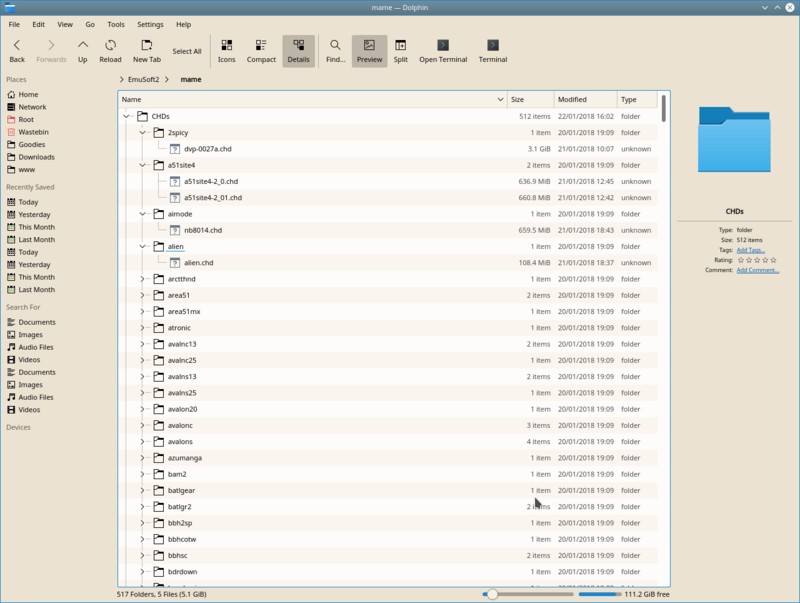 Linux app to install ZEarUX here. Fuse is the popular Spectrum emulator for Linux. It is much more feature rich than ZX32. 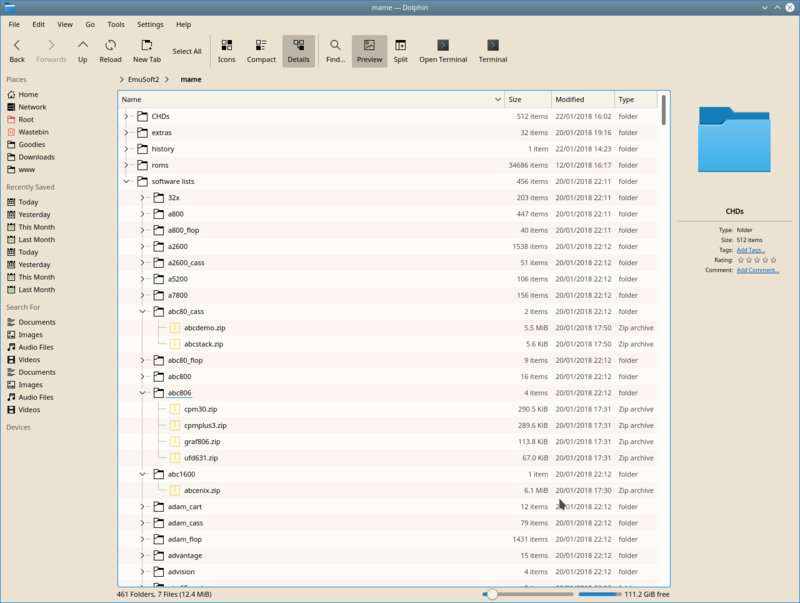 Many Linux repositories contain Fuse. Easier to install than ZEsarUX but noway near as feature rich. Speccy is in active development and offers features similar to Marvin and ZX32. There are hundreds of websites dedicated to old computer systems and games. Here are some of my favorite 8-bit/16-bit nostalgia and retro computer news sites. ZXART for Spectrum art, music and games. Indie Retro News. Popular retrogame news with links to downloads. Romhacking. Rebuilds of old games, new ports of old games and new games for old systems. MyAbandonware. Reviews and downloads of old but mostly abandoned games. Retrospec. Free independent game downloads. a8.fandal.cz. Atari 8-bit games, news and new ports and new games. RomHunter. One of the most compete sets of Atari2600 ROMs. YolkFolk the Dizzy Island games fansite. The Cutting Room Floor discusses Easter Eggs, and unreleased and cut scenes, rooms, tracks and other elements removed from games. Some downloads but mostly points of interest. Win World PC hosts Windows, DOS, Mac, Linux and Unix downloads of vintage, abandoned and pre-release software. Some good hard-to-find finds here. Beta Archive shares downloads for beta software. With an archive of 88TB of data, this is one of the biggest download treasure troves on the Net. Free forum registration required before FTP access is granted. Vetusware hosts a massive collection of abandonware downloads. Free registration required. Multiple Virtual Displays on One Linux PC. Running Concurrently. Now That’s Greedy! Any links to The Old Computer dot com requires registering as a member before any emulator/rom downloads can be made. Just wanted to point that out since it was not mentioned. Thanks for letting us know Kyle. Feel free to share the sites you find helpful (just make sure they’re safe to visit). You stated that as of Sept 2017 you recommend option 2 instead of downloading the latest pack directly from [removed]. Why is that? I haven’t registered for PD, should I worry about using that site? Thanks for a great resource page btw. Great question. I will clarify that statement in the guide. Use either option. Option 2 is easier for people because they don’t need to hunt for the [removed] torrent download instructions. The recommended preference had nothing to do with security concerns. Thanks for visiting. Remember to share this guide with friends. You seem to have updated the guide to recommend Option 1, but after signing up for [removed] and doing some torrent searching and sorting by size, the Complete Set that should be “Option 1” doesn’t seem to be available at all. (there are also no old torrents of a previous version). Has Option 1 been made impossible or am I missing something silly? They are there. I think you might have been on the wrong page. Sign in then try this link [removed]. Thank you so much for your response, greatly appreciated. Can you type the Torrent name and size you’re referring to – even using the search tool, there is not a single torrent (that I see displayed) with the word “Complete” or “Full” in it’s title. I was easily able to find all the pieces needed for method 2. I see the confusion now. Hadn’t thought about that link title enough. You need MAME 0.195 ROMs (split) to play the arcade systems. For the home computer and other systems you need MAME 0.195 Software List ROMs (split), MAME 0.195 Software List CHDs (merged). For the best experience you also need MAME 0.194 Multimedia & MAME 0.194 EXTRAs. The Extras are sometimes a few releases behind MAME. Thanks for the thorough guide. I downloaded the split version of the rom pack, because most people recommend it over the non-merged, The problem is that most of the rom zip folders are empty; they literally say 0 KB and there is nothing inside. Should I go with the non-merged version or is there another website that has it you would recommend? Update: I originally used Windows to extract the folder and ended up with about 5 gigs instead of the 60 i downloaded. Deleted the folder and re-downloaded the whole 60 gig split file again, extracted the same way and got the same result. So i decided to extract it with a the 7z program instead and now all 60gbs extracted correctly. This is my first working with zip files, so maybe it was just a noob mistake, but I wanted to share in case anyone else has issues extracting roms. Edwin, thank you for sharing your experience and advice. I will add this tip to the guide. Can you possibly help me understand what files I need. I got the Rom files and updated to 0.193 and they seem to work in MAME. What are the Software list Roms? Do I need those as well? Are they for different games? 50+GB is a day download so just trying to save myself some time, thanks. Thanks for the clarification. BTW your website is probably one of the best in helping to understand this whole process. Great work. There are ways to update CHDs without going to [removed] or The Archive. I won’t mention them here. This guide is designed to be easy to follow and to provide the simplest routes to downloading MAME ROMs and CHDs. Other providers would complicate this post and monitoring them would sap my time. I’m surprised that there is no mention of AtariAge.com on here. They have pretty much any Atari RON you could want. Initially this post was MAME specific. As time progressed I added links to emulators and sites of interest. I have a few plans for this post. Keep tuned. Unfortunately LoveRoms has been shut down and no longer available and working, so I would recommend adding Gamulator on the list. New website with not so many titles, but they are all working and no malware or viruses. Thanks for the tip. I heard LoveRoms closed due to complaints from Nintendo. I will replace LoveRoms with Gamulator. Will keep my eyes open for LoveRoms’ resurrection and re-add the site if it happens. Anyways, thank you for the great information ! And I will be looking forward to your insights when you have them. I owe an apology. The links work. I was trialling the new Gutenberg post editor with some of our posts. Gutenberg broke the links in this page. All the links work again now. I am sorry about that. I see what you mean. I hadn’t realised EmuParadise had disallowed the downloads already. The download pages are still there so I suspect the download links will be re-enabled in the not too distant future. Maybe when Nintendo calms down. Will look for an alternative download source. Hopefully I find one soon. You can get the update packs from https://www.retroroms.info/page/bda. Navigate to MAME > Update Packs. You need to be a member to download files. where would i find the chd update packs? Hosts of CHD update packs are difficult to find at the moment, what with industry attacks against the sites that offer them. The CHDs in the latest of the out of date CHD packs will work fine on the current MAME release. You can get a few of the more recent CHDs here at RetroROMs. These can usually be drag’n’dropped into an out-of-date set without upsetting the data structure. Hi, none of the MESS games works (0.193 Software List ROMs (split set) ). Computer and console systems works as they are on roms set now but where “0.193 Software List ROMs (split set)” goes? Software directory? Mame says they’re missing. You need to extract the Software List ZIP into your software list directory. I always use separate directories for ROMs, Software, and CHDs. You need to tell MAME where the Software List ROMs are stored on your hard drive i.e in your software list directory. Set the software directory path in MAME > Configure Options > Configure Directories > Software Media. Then get MAME to check the ROMs and software by typing mame -vsoft into a terminal. You didn’t mention the name of the program. I think you are looking for Flash Boy. It is in the ROM set found at the archive.org link. It is called decocass.cpp. Works fine. The latest version of MAME should run the game found at the Internet Archive. You can even play it online at the Internet Arcade. It appears Retro Roms has removed the update packs and some other files! I just had a quick look. They seem to still be present but not yet updated to 0201 or 0202. As soon as I find another source or as soon as I can re-list my preferred source, I will add them to the article. I downloaded 0.197 merged romset and now I need to update it. I downloaded update pack 0.198 but I don’t quite understand how to update my romset. Do I just copy the new files to the same folder or do I need to use some other program. How does it excatly work? This is a great page! It’s really well organized and explained for dummies like me. The only site that provides the updated and complete versions of MAME ROMS and MAME SOFTWARE LIST is PLEASUREDOME. Unfortunately, I am permanently banned from it. MAME complete with all the features available at PLEASUREDOME occupy about 2.5 terabytes in HD.